After creating the world, the great spirit, Gitche-Manitou, created the First People, today called the Anishinaabeg. The word Anishinaabeg (pronounced Anish·i·na·beg) refers to linguistically and culturally related peoples spanning a large region that includes the Great Lakes and land on both sides of the present-day Canada and U.S. border. Manitoulin Island is home to three allied groups of Anishinaabeg peoples—the Ojibwe, the Odawa, and the Potawatomi. The sacred land of the Ojibwe of Manitoulin Island is peopled by power beings called Manitouk. Manitouk are the forces of spirit in everything from rocks to raccoons and are an important aspect of Ojibwe spirituality. 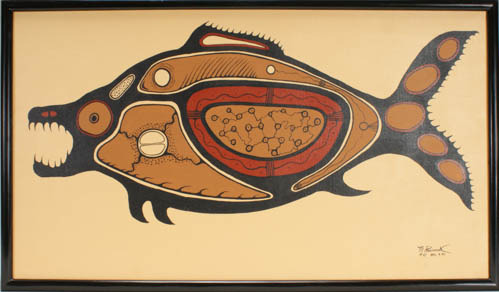 Visual art has long been used by the Ojibwe to preserve and transmit their spiritual heritage, from the birch-bark scrolls and rock art of the traditional medicine society, to the prints and paintings of contemporary artists.